I have no idea how this scam worked. Obviously you get some sort of plastic thing that you hold up to the light and it makes pictures "move" with the Vibra-Viewer. 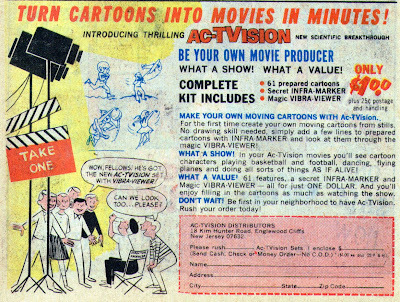 The problem here is that still pictures are 'comics' and moving pictures are 'cartoons' so I never understood the great idea of taking a moving picture and turning it into a movie. It already WAS a movie as far as I was concerned. Jonah Hex #49 "Reap the Grim Harvest"
The corn is all picked and stacked in the cribs (therefore we know that the Hex's have been farming for at least 85 days, so figure in another couple of weeks for plowing and planting) and Jonah and Mei Ling are gazing upon the fruits (or vegetables) of their labors. Ling thanks Jonah for keeping his word for all this time. She asks if it has been worth it and he says he wouldn't have done it if it wasn't worth it. She asks if they can take the rest of the day off and Jonah rolls and lights up a smoke, saying that he has to get the corn into bushel baskets to take to town tomorrow. They have a $6,000 ($108,802 today) mortgage that has to be paid off tomorrow. Mei Ling says that she is going to take all of her clothes and go skinny dipping. Jonah tosses his cigarette over his shoulder and runs after her. Mei Ling is in the pond and Jonah is just getting ready to remove his drawers when Mei Ling notices smoke. The corn cribs have caught fire and are a total loss by the time Jonah arrives. Not only that, but the fire has spread to the barn! Jonah rushes in to the barn and manages to pull out the horses and and some of the tack. Mei Ling is beside herself since the corn was going to pay off their mortgage. Jonah says that there is no reason to get upset and that is when Mei Ling realizes that Jonah caused the fire when he flipped his cigarette into the corn crib. She accuses him of starting the fire on purpose. Jonah tells her that she is having a hissy fit and that he'll get the money and he'll do it without his guns. He shows her that he doesn't have his pistols and that they are in the dresser drawer and she can go look if she doesn't trust him. Mei Ling apologizes for not trusting Jonah and watches as Jonah rides off. Ling goes into the cabin, feeling cold and sick. She opens up the dresser to get a blanket and finds that the pistols are gone! Jonah heads into town and visits the sheriff to pick up some wanted posters. Back at the farm Mei Ling is throwing up into a wash basin and decides to go visit Doc Pedersen. Quite some time later, Jonah walks into a stage depot and calls out Nate Clinton. Clinton turns and fires but Jonah guns him down. Mei Ling shows up at the doc's house to find out why she has been sick. Elsewhere, several outlaws are riding down a narrow trail when their horses suddenly trip on a rope stretched across the trail. Jonah jumps out of a tree onto the leader of the outlaws and takes them all into custody. 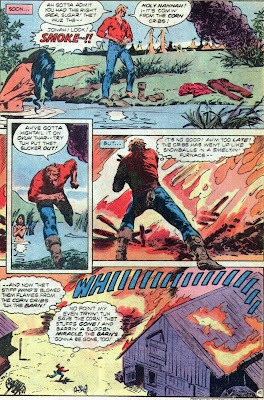 Later that night, Jonah shows up outside a cabin and while he is being shot at by the outlaws inside, he manages to lob several sticks of dynamite down the chimney. Timeline - Well, we know that it has been about4 months (at least) since they started farming (not since they got married). We'll be able to walk backwards in time pretty soon, just stick with me. Not much gunplay action in this story (it's a short story since we also get a Bat Lash backup story) and I have quite a few problems with the logistics of this tale. Once again it centers around how quickly things catch fire. I find it hard to believe that picked corn, which is covered with green husks and has a high water content, will cause such an inferno by having one small cigarette tossed amongst them. Also the speed with which the fire spread was pretty unbelievable. About the only thing this story did was tell us that Mei Ling is now pregnant. However, I did enjoy the story for no other reason than we get to see Jonah being a little bit playful with his wife. 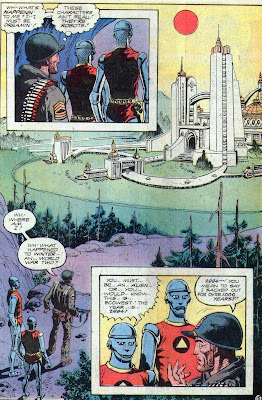 Also, did anyone see that the barn (that burnt down earlier that day) was still there in the last panel? 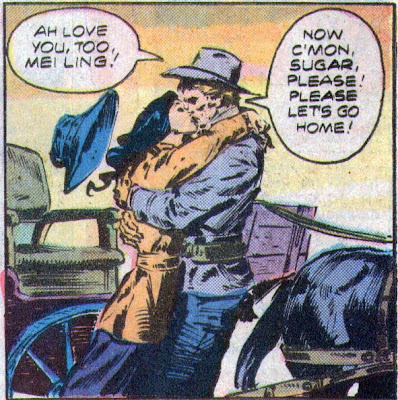 I attribute this to the fact that Mei Ling is also Amish. Next Issue: The snow flies, the fur flies, and the women are thicker than flies. Hey! It's Wednesday! How about a Hembeck? ..by adding FLYING FREAKING SAUCERS!!! Nope, it's not a misprint. 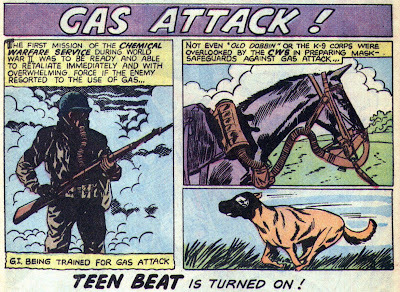 It's an old article from Mad Magazine that I found in a Mad paperback. 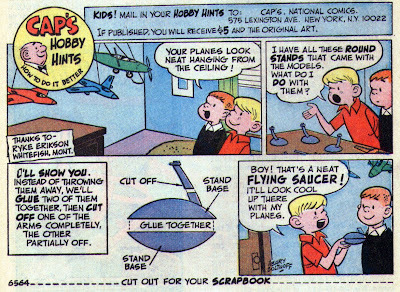 The premise is basically "What would a Nansy strip look like if done by other comic strip artists?" And here are the other spins on this strip: I know that Mike Sterling would enjoy these. I love the Daisy Mae/Nancy and the Donald Nancy scares the hooey outta me. Sgt. Rock is probably one of the best fighting machines in comics (I include even Omac here) but the weirdest issue had to be the one with Rock ending up 2994 and fighting alongside robots. It is a two-parter and I'll have to see if I can locate #326 and find out how everything ends up. 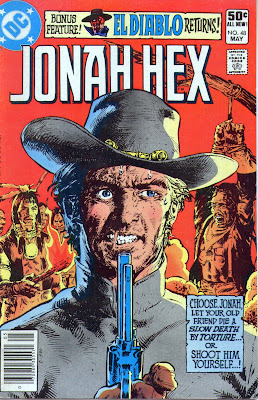 Hey flat-top, have you checked out this Jonah Hex site? I love it, especially the often-humorous take on the comics. It's clearly a labor of love for the blogger, who wasn't even born when DC Comics published Jonah Hex. Just for the record, I was born the year JFK was elected. 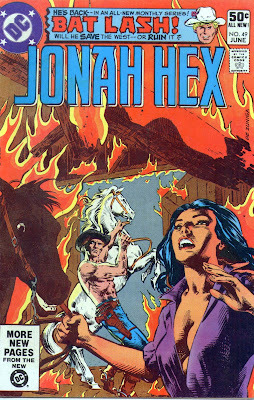 I stumbled on a few posts about the Jonah Hex movie. 1) A nice photo of Thomas Jane as Jonah Hex. 2) The real story behind the photo. Jonah Hex #48 "The Vulture Creek Massacre!" A hail of gunfire and Jonah Hex cuts down 4 liquor bottles in their prime. Well, actually, AFTER their prime since they're empty. Jonah is just target practicing, but the gunfire brings Ling running out of the house to see what the ruckus is about. Jonah says that he did promise to give up bounty hunting, but target practice isn't bounty hunting. Just then we see a man on the horizon leading a horse. The man starts shouting to Jonah and it turns out to be an old friend of Jonah's, Samson Graves. Graves is an uncouth, tobacco spitter that rode with Jonah back in the Army scouting days. Graves says that he heard a rumor that Hex got himself hitched and hung up his guns. The two men go walking off for the farmhouse, laughing and joking about old times. Later during dinner, Mei Ling asks Jonah if he thinks Graves would be more comfortable removing his gloves for dinner (I love how women will ask if you would be more comfortable doing something that THEY want you to do that will actually make THEM more comfortable). 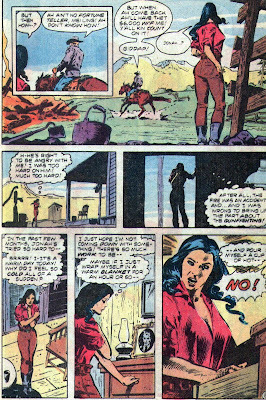 Jonah starts to explain that it isn't a good idea, but Graves interrupts and explains to Mei Ling how the two men were scouts for the 4th Cavalry, riding point against the Paiutes. One day Graves finds a small Indian girl drowned in a pond. He pulls her out and is suddenly surrounded by several dozen braves. He is taken to their camp, tortured and then tied down and has his fingers cut off, joint by joint. Jonah comes riding into camp, shooting like a wild man, throws Graves onto the back of his horse and rides off, saving Graves life. Graves explains that the fingers of his gloves have wooden pegs to fill them out, but he would be happy to remove the gloves rather than be ill-mannered. Mei Ling balks and suggests that he leave them on. After dinner Graves says that he needs Jonah's help. Graves has been followed by Indians for several days. He stopped at a creek to get some water when he was surrounded by Crow Indians. Graves killed them all but one, which got back to the rest of the tribe and they have been hounding him for days. Jonah says that he'll go see what can be done and gets his rifle down. Mei Ling wants to know what is going on but Jonah hardly explains anything and heads out with Graves. They ride all night and catch up to the Indians following Graves. Up in the hills overlooking the Indians, Jonah, using binoculars recognizes the leader, High Hands Bear, and old friend of his. Jonah decides to ride down and talk when suddenly Graves jumps up and starts shooting and screaming that they are under attack. 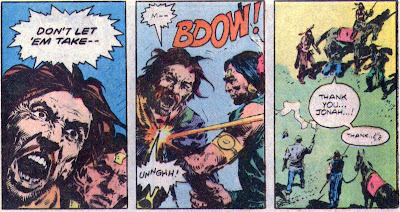 Jonah grabs Graves rifle and beats the crap outta him and they suddenly find that the Indians have them surrounded. Jonah asks High Hands Bear what is going on. High Hands explains how Graves, at the creek mentioned earlier, shot and killed four innocent Crow children and that according to the treaty the US has with the Crow nation, they can take Graves back to their tribe to face trial. The Indians grab Graves and he starts screaming that he can't go back, the Indians will torture him again and that he can't go through with it. He is screaming and begging Jonah to do something, to stop them, to help him, to do anything. Jonah shoots Graves in the heart and as Graves falls to the ground, he thanks Jonah. Hex mounts up and rides back home. At home, Jonah can find no sign of Mei Ling and takes off looking for her. He eventually catches up to her wagon. Ling explains that she cannot be married to a rifle and sixguns. Jonah asks if she no longer loves him but she says that she does, but she also loves herself enough not to live in a violent storm. Jonah swears that it will never happen again. They swear their love for each other and ride back home in the wagon. 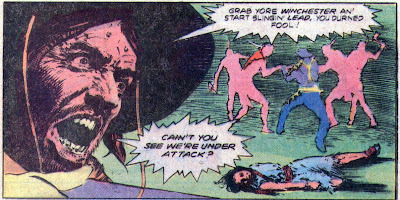 The Jonah Hex recap in the right gutter is going to be in a mess for a short while. I used to have thing sorted by oldest to newest, but the new blogger format only allows you to add new ones to the top and then slowly shift them down a line at a time. I'm trying to invert the order so the newest ones will be at the top and that might take some time. ...To explain how not being about to afford gasoline is for your own good. Wubble Bubble...ya know ya want it, ya know ya deserve it, so use that check from the Feds and order some TODAY! 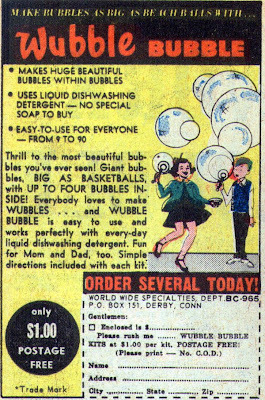 Of course you should realize that it's made from dishwashing detergent! What are you actually paying for here? 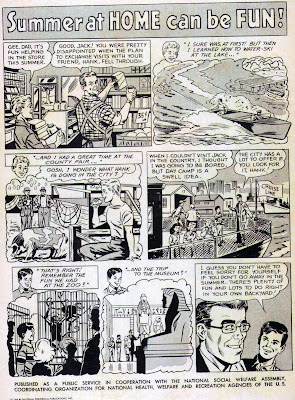 It's been a looong time since we had a wonderous moment in comics but I now present you a page from a Blondie comic from 1975. 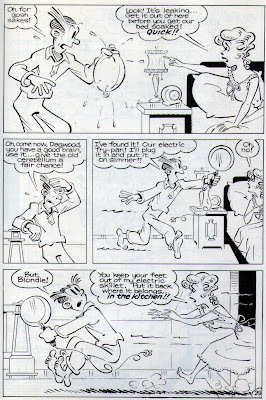 Not only is Dagwood trying to bring an electric skillet to bed, the entire thing is written in Cherokee! Here is the English translation from later in the book. The book was developed by the Cherokee Bilingual Education Program in Tahlequah, OK, and was translated by Martin Cochran. Man o man o man o man. 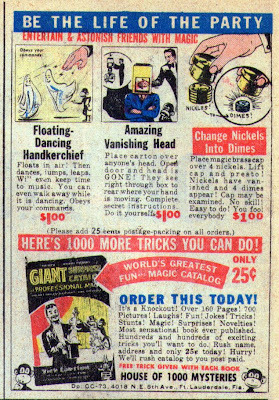 I've been cleaning out the garage and came across an old Nick Fury comic and guess what they're selling over at Marvel comics. Sweatshirts for $2.98! 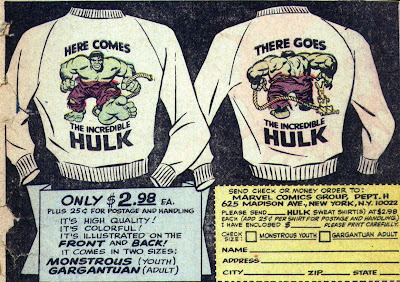 Not only just sweatshirts, but shirts with the Incredible Hulk!! I want one sooo bad and I want to wear it to the new movie coming out, but I'm not sure I can handle the 25 cents shipping and handling. The part I love the best is the back with the pull toy rabbit. I want to see THAT in a story today.